Archaeologists from the Wisconsin Historical Society are available for in-person presentations and demonstrations on various topics. Society archaeologists have worked throughout the state on a wide variety of archaeological sites and can share fascinating new insights about Wisconsin's past with groups of all ages. 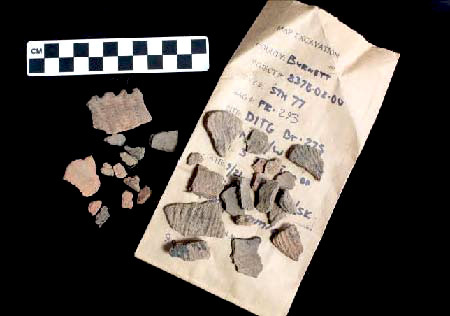 To learn more about these services, please contact John Broihahn, State Archaeologist. These artifacts are from an archaeological site in Wisconsin. Invite Society archaeology staff into your classroom. Students will learn about life in Wisconsin’s recent and distant past. They will also learn how archaeologists use artifacts and sites to understand past lifeways. Become acquainted with aspects of early Native American life in Wisconsin. Have the hands-on opportunity to examine real and reproduction artifacts. Learn how archaeological methods and techniques help us understand the past. Presentations are generally geared toward fourth-graders, but may be adapted for younger or older students. Society archaeologists can also make presentations on archaeology as a career for middle- and high-school students. Presentations are available on a limited, first-come, first-served basis for classrooms in the south-central Wisconsin area (Columbia, Dane, Dodge, Green, Iowa, Jefferson, Lafayette, Rock and Sauk counties). Presentations may be arranged for classrooms outside of south-central Wisconsin in some circumstances. For information regarding the availability of our archaeology classroom presentations, please contact Denise Wiggins, MAP Laboratory Coordinator.